We had a rather special guest(s) in the office for a tasting and as he came from Bordeaux we couldn’t serve him anything from that fine region. Instead we served the above wines but not before we started with Delamotte Blanc de Blancs 2002 which is drinking superbly now, just the beginning of a bit of biscuit appearing but essentially still focussed and fine with a linear drive. If you own any then you’ve done well to keep it, just let me know if you need a “hand” drinking it. We then went for Chevalier-Montrachet Grand Cru 2009 from Domaine Leflaive which was both very much a Chevalier and very much not a 2009. Real focus and saline, slight reduction but tightly wound. No goey-ness here which was good. Opening white Burgundy can be a game of roulette and I would still recommend a read of the guest post by my colleague Sara on premox. The wine got better in glass and the remnants smelt lovely, white fruits. So to the reds, the Vosne-Romanee 1er Cru Cuvee Duvault-Blochet 2006 from DRC is a wine I last had here – it showed just as well this time but a little more focussed and a little less rich, slightly less 2006 ish you could say. Lovely elegance and drive with a core of darker red fruits and a real lift, clearly a wine with a long future but certainly not a waste to drink it now. Obviously always a bit of a treat given the name of this blog! 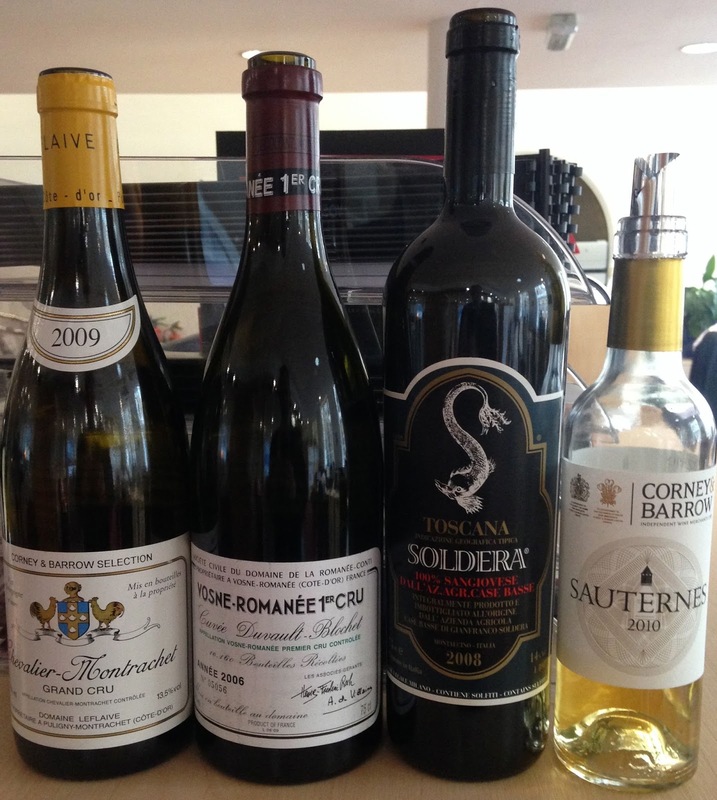 Soldera 2008 – was next up and not a wine our visitors knew. I last tasted it here, on a brilliant visit to Case Basse (mind you they all tend to be). The wine has such incredibly purity with slight spice behind that and a wonderful energy. There is a salinity that makes it just about the most drinkiably moreish wine I know. I am biased, and I’ve said this before, but I really don’t think anyone gets near Gianfranco when it comes to Purity from Sangiovese.